PUPs and other silent intruders cannot be called malicious, but these infections affect the performance of your device and diminish time online. Weknow.ac is one of the most browser hijackers who can change various settings of your Google Chrome, Mozilla Firefox, and Safari since this is an intruder targeting Mac OS supporting devices. The modification includes changing the default new tab, search engine, and homepage options, redirecting every search to suspicious sites and displaying altered results. Also, these silent cyberintruders are known for the information gathering feature that allows Weknow.ac and other similar programs to access various personal information. Users IP address, geolocation, browser history habits, search queries, and other online activity related information can be tracked and possibly collected or even shared with third-party advertisers. This is typical for adware-supported programs. However, it is known that this particular threat always changes various features of the program, so it becomes more persistent for your antivirus tools. Each banner, pop-up ad or blinking window is displayed on the screen contains a script that gets activated after a click on the advertisement. It means that every tie you click on that commercial content you get redirected to a website that displays more commercial content or even executes the download and installation of additional tools or programs. Various browser extensions, toolbars or applications might be added without your consent, permission or even knowledge. 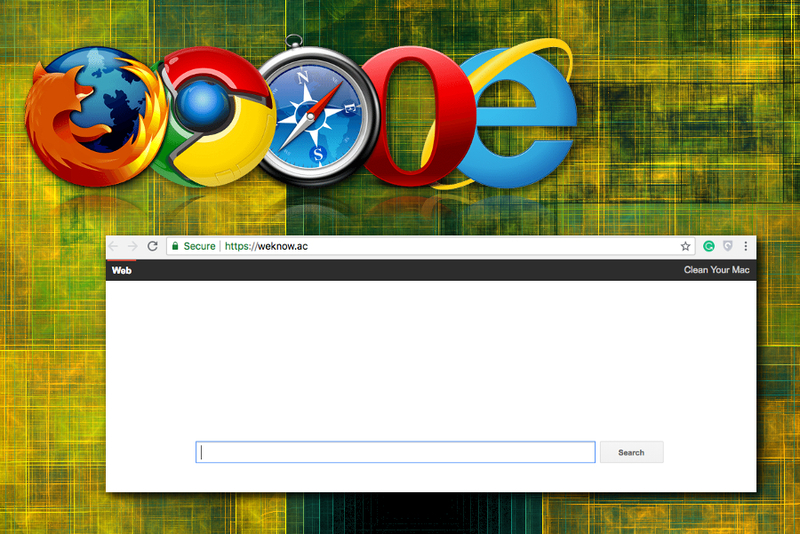 This is the intrusive behavior of browser hijacker. These redirects aim to create traffic to sponsored and possibly affiliated sites and generate revenue for the advertiser. This is called pay-per-click revenue when each click creates pay. However, these websites can be malicious and contain more than intrusive advertisements. Often advertisements on these sites look attractive and promote useful tools or programs. You should be cautious when redirected to these sites. Be sure to click the X button and do not enter any other page. This Weknow.ac website redirects to various sites and advertisements promoting rogue tools and programs. The main search engine even advertises the tool for cleaning your Mac. However, don’t get fooled, these useful-looking sites are nothing but intrusive. You cannot get any value from these suspicious optimization tools. Those promising features are, in most cases, not true. Some of them can even make changes on your device that affect the performance in a more negative way than the PUP itself. You need to avoid Quick freeware installations and always opt for Advanced or Custom settings when downloading and installing software, application or even updates. During these processes, freeware can be bundled with potentially unwanted programs, and if you are skipping through some steps, you can get additional programs unwillingly. This makes your system infected with PUPs and similar threats. You can get rid of these intruders with anti-malware tools while scanning the system fully and removing possible threats.